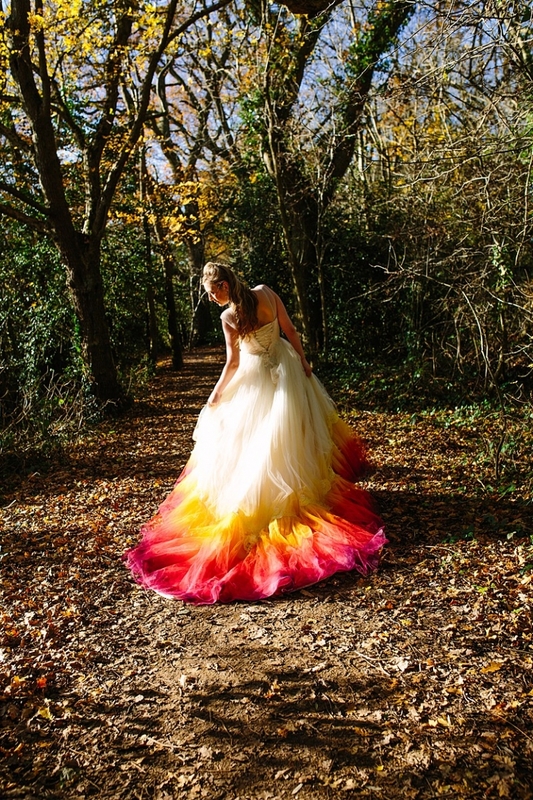 The dip dye dress, called ‘Phoenix’ was first designed and made as a romantic ivory silk and tulle wedding dress for another shoot but was perfect to upcycle as a canvas for the colours of autumn. Sustainability and un-needful waste in the fashion world are causes that run deep in my philosophy so recreating a dress into a new incarnation was not a compromise but part of the basic premise. As a labour of love I spent 7 hours spraying six colours (with the lace trim carefully masked) to produce the final ‘dip-dye’ effect of the finished article. 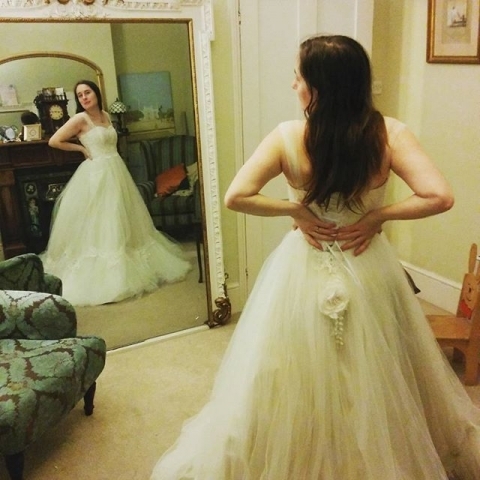 This dress is available to hire for photoshoots, or to buy for a wedding or as costume. Please contact me direct for rates and terms and conditions, pertaining to purchase and hire. ‘Dip-dye- has been quite a wedding trend (not to mention for hair styles and home furnishings too) in 2016 and 2017. But in fact a true dip-dye is almost impossible on most wedding dresses. Only natural fibres can be dyed and many dresses, even high priced, high quality ones are made of man-made fabrics. The tulle of this dress is polyester, though the fabric beneath is silk so dying-proper was not an option. 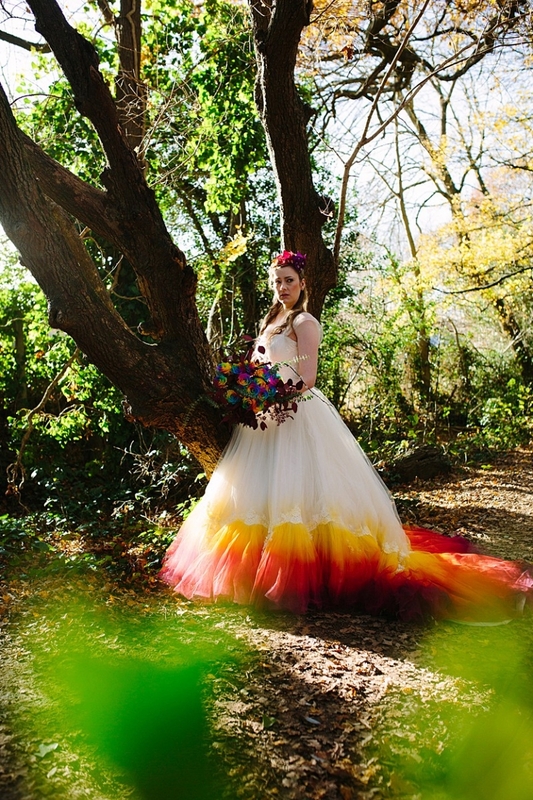 In fact most ‘dip-dye’ or ‘ombre’ wedding dresses have been sprayed, not dyed and so I followed suit. After some careful research (asking people who might know) I opted for a florists spray called ‘Oasis’. The florist working with us on the photoshoot (Michelle Knibbs of Muscari Whites) kindly donated me the spray cans from her stash. Here is the dress before work began… virgin as from the previous photoshoot and modelled here by yours truly! Here was the design I had in my head, though some of this didn’t come through in the final look. The other creatives on the team were less keen than I to go all the way with large leaf headdresses and curling ivy tendrils. 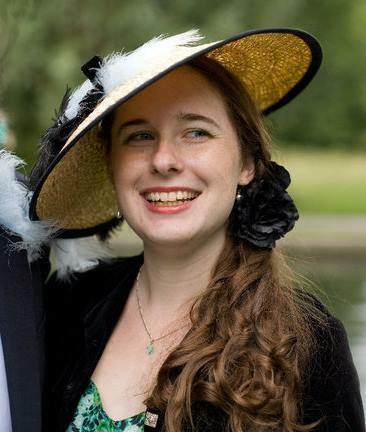 I love flights of fantasy, but a ‘realistic, if unusual wedding’ look was also part of the premise! Below an image of the very famous ‘dip-dyed’ (but actually sprayed) wedding dress that went viral in 2016 and was the starting point for all this work. And some lovely autumn coloured leaves, which I loved as my inspiration palette! The dress below dress goes all through to blue at the hem, but ours was not trying to be a copy, the similarity in colours is only co-incidental as our Autumn theme demanded the yellow, orange and red! 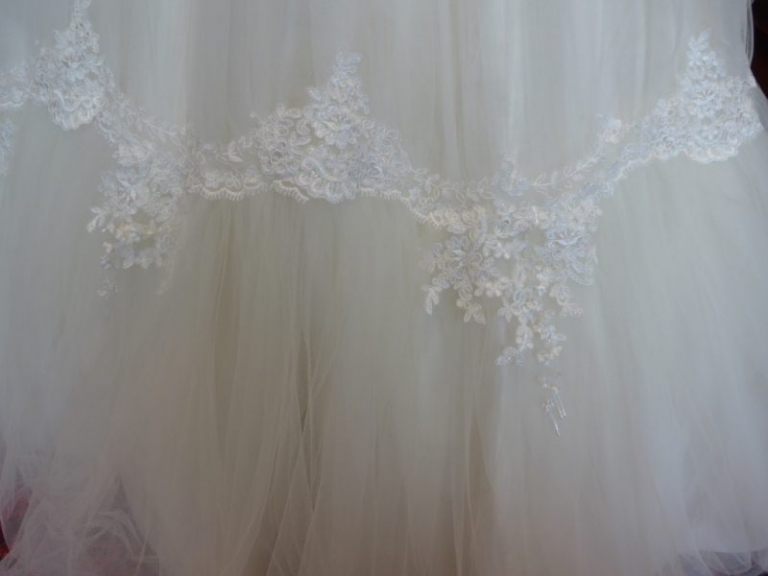 First I did a spray test on some fabric samples, using the same silk, tulle and lace. I was very lucky with the weather and able to work all day layering up colour with drying periods in between. I masked the lace trim with tape and set to work. Layering from below the lace trim I started with two shades of yellow and then orange and the first shade of red. I worked outwards towards the hem, the bands of colour widening as I came round the back of the train. Three shades of red were graduated into a touch of purple at the very edge, which makes the yellow at the other end of the rainbow really ‘pop’. I sprayed and sprayed, not just each colour, but also the same colours again as second and third coats, moving the tulle around as I worked to ensure it was coated evenly and without any bare patches. Once I was finished spraying I removed the tape and decided to add one very light layer of yellow over the lace trim and just above. The effect was very subtle, but just enough that the lace did not seem to harsh and sudden a contrast with the colour below. The finished dress was not quite as saturated with colour as I would have liked. But I was limited on both time available (with another two dresses still to make for the shoot) and the spray cans ran out! You can see can another coat would have filled those paler areas, but for the shoot we were good to go! A shot from behind the scenes creating the image above. So much is in the fantasy! The plastic cover for the ground in my garden wasn’t perfect but the spray I got on the paving proved very attractive to our photographer who made good use of it in quite a few close up and detail pictures! with thanks to all the other creatives on the photoshoot team! « Marilyn Monroe was a size 16… or so they say! The nightmare that is women’s sizing today.